This is a convenient place for me to put information people have asked for in the Cub Master Section of the Bridal Veil Falls District round table. You can contact me (Brian "the walrus" Jarvis) at roundtable[at]thewalrus[dot]com. Please put "[Cub Scouts]" in the subject to help separate your email from spam. Jim Richardson created some lists of cub scout requirements that can be met at pack meeting. Here is his original file. Here is a simple web version. There are many other awards that can be eared by Cub Scouts, such as the Cub Scout 75th Anniversary Awards. Additional training links can be found on the UtahScouts.org training web page. Jim Richardson wrote a Cub Scout Chant and shared it with us. Here is a collections certificate that I used. Richard Adams created some certificates for his Cub Scout Olympics. Here are` the Microsoft Word documents he created: #1 and #2. You may need to fiddle with fonts if your machine does not have the ones he used. Richard has also created some soundtracks and has made them available as MP3 files at this link. April 2003: Lights, Camera, Action! Our icebreaker was a vocabulary game where the participants invented new definitions for interesting (but real) movie terms. Here is the MSWord document I used. This is where I got the definitions. February 2003: Why Does it Do That? Our preopener was crossword puzzle and word search about great inventors and their inventions. Here is the MSWord document I used. Our preopener was a matching game with States and their nicknames and mottos. Here is the MSWord document I used. Here is the MSExcel document with the raw data. We talked about Baloo's Bugle: Volume 9 Issue 3 - October 2002 and Tatanka Tips. I found the latter with this google search. Here is the MSWord document I used. It has the instructions, words, and a sheet of badges. 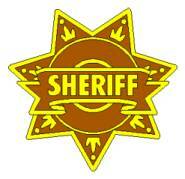 Here is the sheriff badge image.